Tim was a 12-year-old shortstop in North Carolina in 1977 when scientists using the submersible Alvin made a startling discovery near the Galápagos Islands: Lush communities of animals were thriving on the sunless, volcano-strewn seafloor. Two years later, Shank still wasn’t paying much attention to the news when scientists returned to the Galápagos Rift, looked out Alvin’s tiny view ports, and saw a garden of slender white tubes with blood-red, feathery tips. They had found tubeworms, mussels, clams, and other exotic creatures thriving on the chemicals venting from the ocean bottom. “It wasn’t until college that the animals and the geology of hydrothermal vents really caught my eye,” said Tim. As he pursued degrees in marine biology, first at the University of North Carolina, then at Rutgers University, he began learning about the famous Rose Garden, where scientists first learned of the amazing vent animals that have adapted to life in the most alien of earthly environments. Three decades later, Tim is now an assistant scientist in the Biology Department of the Woods Hole Oceanographic Institution, which he joined in 1999. 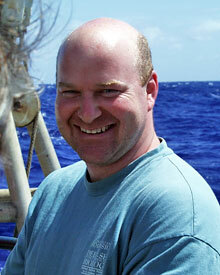 He now specializes in the ecology and evolutionary genetics of those amazing creatures on the seafloor. Growing up in Needham, Massachusetts, Suni Williams didn’t think of herself as an astronaut. To her, space was The Jetsons and the Robinson family (“Lost in Space”). As she was finishing high school, she thought she wanted to be a veterinarian; then during her college studies at the U.S. Naval Academy, she thought she'd be a Navy diver. Then she wanted to be a jet pilot--Top Gun having recently hit the silver screen. Eventually she settled on helicopter pilot, “the second best view of the Earth,” she says. 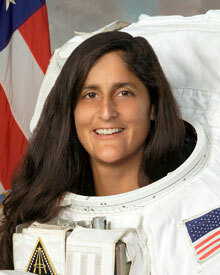 Suni claims she didn’t know anything about being an astronaut...until one day she did. Williams had become a test pilot when she was sent to NASA’s Johnson Space Center and heard a talk by former astronaut John Young. Nearly ten years later, Suni is now making her first trip into space a long one. She has logged more than 2770 flight hours in more than 30 different aircraft, but nothing compares with the six months she is now spending 200 miles above her home.